Knowledge Sharing – 2017 – Philippine KOICA Fellows Association, Inc. 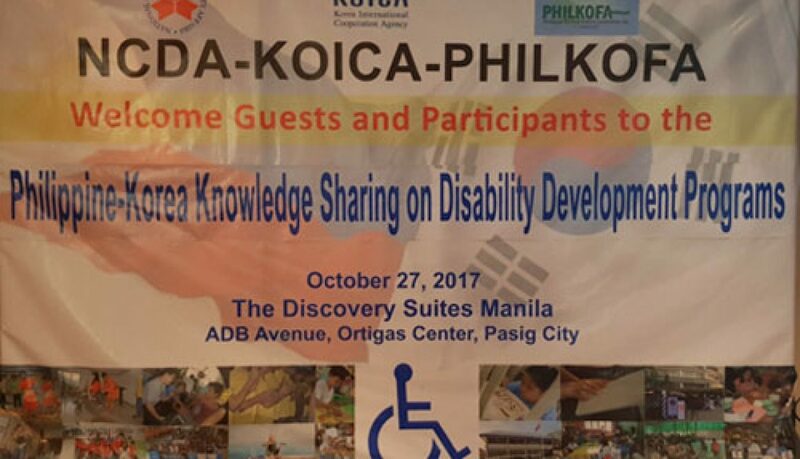 The knowledge sharing consisted of lecture-presentations and discussions on the various disability programs of the Republic of Korea (ROK) and Republic of the Philippines (RP) delivered by distinguished lecturers/resource persons from the National Council on Disability Affairs and other partner agencies. The following topics and areas were discussed: Korea’s Social Development Policies on Disability and the Philippine Government’s policies on: ) Social Welfare and Service Delivery System for Persons with Disabilities, Accessibility and Barrier-Free Environment, Vocational Rehabilitation and Employment Programs, Special Education/Inclusive Education Program, Sports and Cultural Programs, Public Policy and Legislative Agenda on Disability and Human Rights and Justice of Persons with Disabilities. The participants were stakeholders from the different national government agencies and entities who are directly or indirectly responsible in delivering services to persons with disabilities, majority of them are members of NCDA Governing Board. It also included representatives of non-government organizations and disabled people’s organizations. PHILKOFAs outreach activity- training on Food Safety, Hygiene and Sanitation was participated by Nahulid MPC , Pancil Association for Ecological Rehabilitation, Association of Farmers and Advocates of Organic Farming, Inc.(AFAOFI), I Love Me Guapas and the Buenavista & Pamahawan ARBs MPC (BUENAPAMA). It aimed to give participants significant knowledge and information on how to produce clean, safe and quality products. The Nahulid MPC of Municipality of Libagon produces vegetable noodles made from squash, malunggay, saluyot, seaweeds and squash with malunggay noodle. The Pancil Association for Ecological Rehabilitation of Pancil, Malitbog produces guyabano tea and sambong tea. AFAOFI of Himakilo Bontoc produces coco vinegar I Love Me Guapas of Maac Sogod is producing buko pie and the product of BUENAPAMA in Bontoc is banana chips. Seminar on Food Safety hygiene and Sanitation is important for the organizations that processed foods. The knowledge they learned from the seminar was especially crucial since these organizations are required to secure a License to Operate from the Food and Drugs Administration. The seminar provided the participants the idea and information that a food manufacturer/processor must meet to ensure that the products they produced are of high quality, free from contamination, mix up and errors. The good practices were emphasized so that every food manufacturer must remember to observe them so that the products will not pose any risk to the consuming public. PHILKOFA also distributed hygiene kits composed of soap, towel, toothbrush – to 200 kids at Barangays San Jose and San Roque, Malibog, Southern Leyte. Ms. Tess Puente, BOT Treasurer and licensed nurse lectured on proper brushing, washing of hands during the short program. PHILKOFA provided snacks to these kids. Further, 45 Solar lamps were distributed to fisher folks. 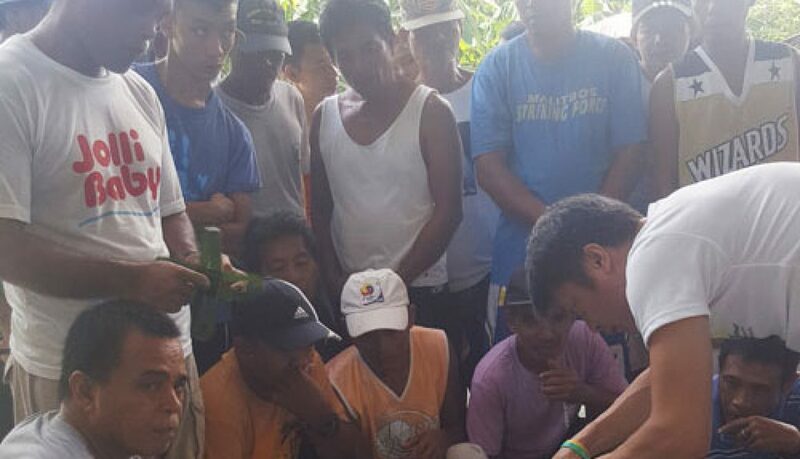 Mr. Alvin Barbosa, BOT VP for NCR, demonstrated how to install and charge the battery using solar energy. The beneficiaries were required to sign a deed of donation. PHILKOFAN from Maligbog will monitor the use of these solar lamps.